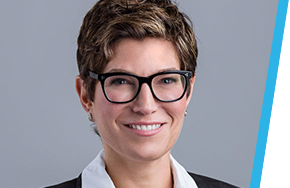 Christina Mainelli, Executive Vice President and Chief Growth Officer, has more than 15 years of experience in all facets of health care delivery from payer to patient, with direct experience growing and scaling businesses. Christina is responsible for ensuring that Beacon’s long and short-term strategies drive client growth and retention and align with the mission and vision. She leads Corporate Strategy and Analytics, Product Development, Marketing and Sales Operations for Beacon. Christina serves on Beacon’s Executive Leadership Team and has P&L responsibility for the Employer Division, the Crisis Product, and Beacon Care Services, a newly established business that increases access to quality mental and behavioral health services through the direct provision of care in local communities. Prior to her role at Beacon, Christina was the Senior Vice President of Post-Acute Care at CareCentrix, where her responsibilities included product strategy and design, technology enablement, market development and growth of top-line revenue. Prior to this role, Christina was the Chief Operating Officer for Sleep Management Solutions (SMS), a wholly owned subsidiary of CareCentrix. As COO, Christina had P&L ownership, led the company’s clinical and operational teams, and drove technology innovation. She led the organization through exponential growth nationally. Christina has also held a variety of leadership roles at Anthem. In her most recent role, she was Vice President of Strategy and Governance where she directed the development of Information Technology, eBusiness and Operations strategies for the enterprise. As part of this role, she led the governance of WellPoint’s $1 billion IT budget with the C-suite. Before joining WellPoint, Christina held leadership roles in Product Development and Account Management at ChannelPoint, Inc., a health care technology start-up, and served as a Senior Manager in Accenture’s health care practice where she provided strategy, change management, and technology consulting to national and regional health plans. Christina holds a Bachelor of Science with a concentration in finance from the University of Vermont and a Master of Business Administration from Yale University, where she also serves as a delegate on the Yale Alumni Association.